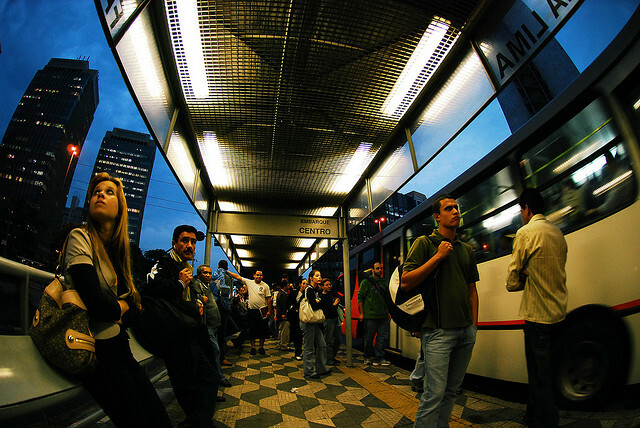 Cities like Sao Paulo can help take the lead on sustainable transport policies and projects. Photo by Gustavo Gomes. A message from Luis Antonio Lindau, director of EMBARQ Brasil (the producer of TheCityFix Brasil.) Read this post in Portuguese here. Leaders from the world’s biggest cities convened in Sao Paulo earlier this month to find solutions to climate change during the fourth C40 São Paulo Summit. This is a critical time for mega-cities all over the world, not just for those in Brazil. All cities face the same burden of rapid motorization and population growth, which leads to many other problems, such as global warming, air pollution, congestion, and inaccessibility to jobs. For the first time in history, cities are home to more than half of the world’s population, and account for more than 70 percent of the world’s greenhouse gas emissions. These two trends create an unprecedented opportunity for policies that favor sustainable transport and urban development. In Brazil, specifically, there are several major factors shaping this opportunity. For one, Brazil’s high rates of economic growth and consumption require greater investments in energy, sanitation, housing, and, of course, transportation. Brazil will soon be the center of the two most-watched events of the decade: the 2014 FIFA World Cup and the 2016 Olympic Games. In 2009, the Federal Government launched the Plan for Accelerating the Growth (PAC), providing $6.6 billion for urban mobility in host cities for the World Cup and Olympics, followed by a second round of $12 billion. Urban and transport planners are working hard to upgrade urban infrastructure to manage the millions of visitors expected in Brazil. Thankfully, Brazil is already much less car-dependent than other countries, with urban mass transit making up to 60 percent of all motorized trips in urban areas, with the great majority on buses. Over the next few years, many trips on public transport will be made using state-of-the-art bus rapid transit (BRT), which was pioneered by Curitiba in the 1970s and now serves as an example of high quality, low-carbon transport for cities around the world. Some of the BRT corridors planned, like those in Rio de Janeiro and Belo Horizonte, will handle peak flows above 30,000 passengers per hour. BRT goes beyond improving mobility; it also reduces air pollution, greenhouse gas emissions, noise and traffic crashes—at 10 percent of the cost of rail. Because of these benefits, the 12 host cities of the World Cup plan to build 500 kilometers of new BRT corridors, nearly doubling the current number of kilometers of BRT in the entire continent. In addition to investing in BRT, Brazilian cities are investing in new roads, bicycle paths, flyovers, metro, suburban and light rail systems, to create truly integrated transportation options. Some of these developments will serve people living in neighborhoods that currently have limited access to public transit, improving the current situation that is both inequitable and unsustainable. EMBARQ Brasil, a nonprofit created in 2005 (and the producer of TheCityFix Brasil), is helping to develop integrated low-carbon transport systems in several Brazilian cities, including Porto Alegre, Curitiba, Belo Horizonte and Rio de Janeiro. Our field experience reveals that cities should not act alone; they must rely on regional cooperation to be successful. That’s why EMBARQ helped establish the Latin American Association for Integrated Transport Systems and Bus Rapid Transit (SIBRT), a membership organization designed to share best practices from the most important transportation agencies from Latin America. After all, sustainable transport can also help solve another global epidemic: death on dangerous roads. Nearly 1.3 million people around the world die in road crashes every year, and this figure will likely double by 2030. Road traffic injuries are the number one cause of death among people aged 10-24 years. Pedestrians, cyclists and motorcyclists are especially vulnerable. In Brazil, 23 people die on motorcycles every day, accounting for nearly one-third of all road deaths in the country. This is unacceptable—and preventable through better road design and transit options. Towards this end, EMBARQ is proud to be a member of the Global Road Safety Program, from Bloomberg Philanthropies, established by New York City Mayor Michael Bloomberg, who is also the chair of the C40 Cities Climate Leadership Group. With all eyes on Brazil, we must seize this opportunity to take the lead on sustainable transport. These improvements in our urban environment will not only accommodate the millions of visitors who come here temporarily, but they will also provide for the millions more residents who will reap the long-term benefits of sustainable transport: reduced greenhouse gas emissions, cleaner air, safer streets, and greater social and economic inclusion. Top Blog 2011: Vote for TheCityFix Brasil!